EVs are batteries on wheels. There are times when it would be nice to use these batteries for more than just moving the car. Nissan has started a program called EVs for Resilience that would allow for just that. 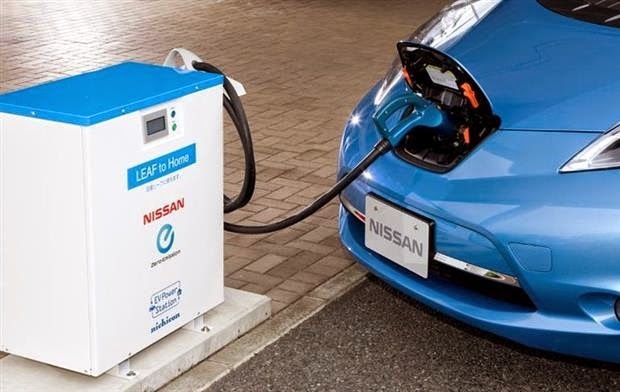 Nissan's Vehicle-to-Home (V2H) system would allow you to use a Leaf as a power source during times such as a natural disaster or power outage. They estimate that a fully charged Leaf could power a home for 2 days. In the case of a simple downed power line, it would be possible to drive a short distance, charge up the car and bring back a nearly full charge to continue running your home. Taking this a step further, at the Geneva Motor Show 2015, Nissan has formalized a partnership with the Spanish energy company Endesa. They will work together on Vehicle-to-Grid (V2G), using an energy management system that will draw energy from Nissan EVs when the grid energy demand peaks. Below is a video promoting Nissan's EVs for Resilience strategy. One of the things that people often worry about before they buy their first EV is "What do I do if I run out of charge in the middle of nowhere?" After a couple of months driving an EV, this is generally alleviated. Way back when gas stations were few and far between, this same concern existed for gas cars and in many cases it was solved with the gas can, known as the jerry can. A Dutch startup called Star Engines wants to bring a similar solution to the burgeoning plug-in vehicle market. They call their idea the Jerr.e. 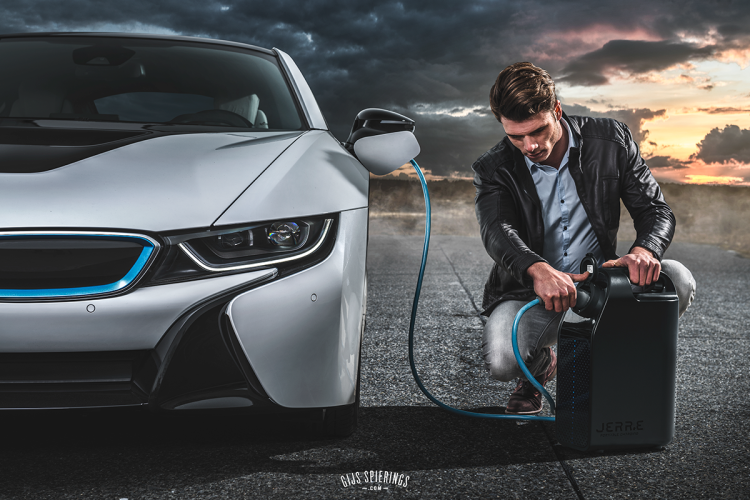 The Jerr.e is a portable gasoline generator in the familiar shape of a jerry can. It has a patented, small, efficient, light weight, 3D rotary engine. It holds 1.3 gallons of gas and can deliver 30 to 40 additional miles of range. We have written about range extender trailers before here and here. The trailers have the advantage that they can charge the car as you drive down the road. However, this would require modifications to your car. 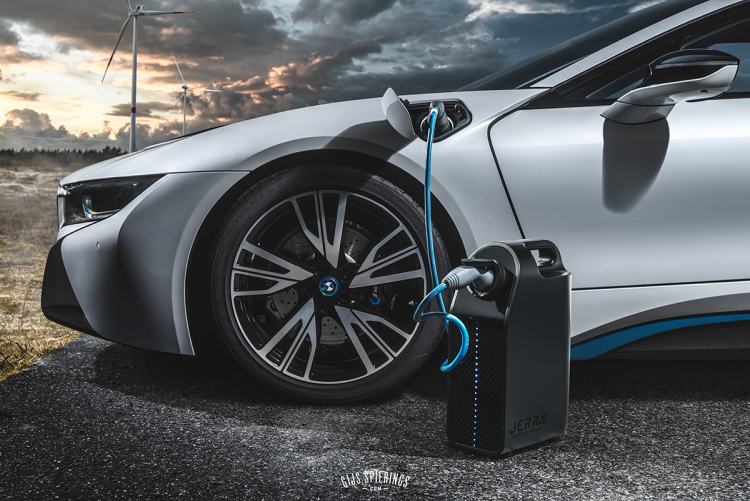 The Jerr.e has the advantage of being small, portable, and utilizing the charging port that is already on your car. Star Engines plans to start shipping these in 2016 and they would like to have partnerships with dealers and auto manufacturers so the Jerr.e could be ordered as an accessory when you purchase your next car. 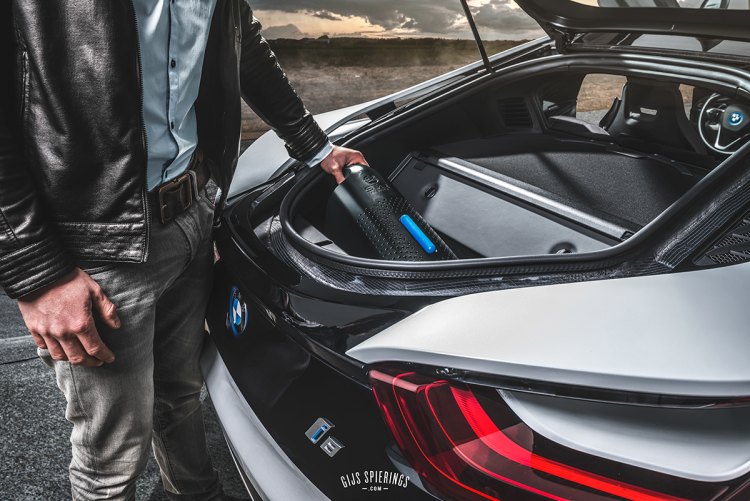 If you are looking for some peace of mind that you can store in your trunk, or have that one annual drive that is iffy for the EV, this is something to consider. 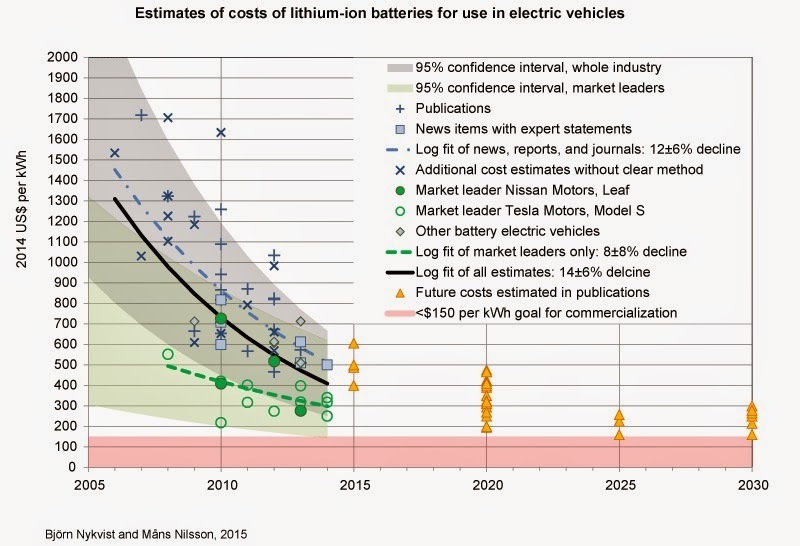 The biggest cost in an Electric Vehicle (EV) today are the batteries. However, EVs are far from the only things that use batteries. 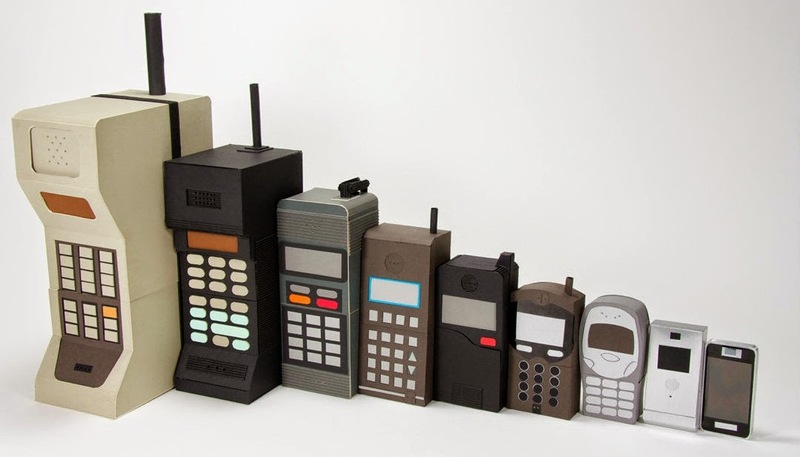 Ever since the first mobile phones, our demand for smaller, longer lasting batteries has been growing. As we move into wearable technology, e.g. smartwatches, this trend will continue and EVs will benefit greatly in both cost and range. How much will prices drop? Future estimations are difficult, but there are some techniques that can be used. First, are there any immediate technological barriers? Looking at recent research shows that minor improvements are being made in labs around the world. Many of these make great claims that they will result in 4 or 5 times the battery performance. These claims are likely exaggerated greatly, but the volume of them alone likely means that the trend in production price reductions will continue into the near future. Second, are there any long term barriers? Several technologies are vying to be the next big thing: lithium-sulphur, lithium-air, solid state batteries, graphene, ultracapacitors... One or more of these (or something new) will likely continue the trend beyond the ten year horizon. Finally, now that we have some assurance that the trend will likely continue, we can ask, "What are the historic trends?". 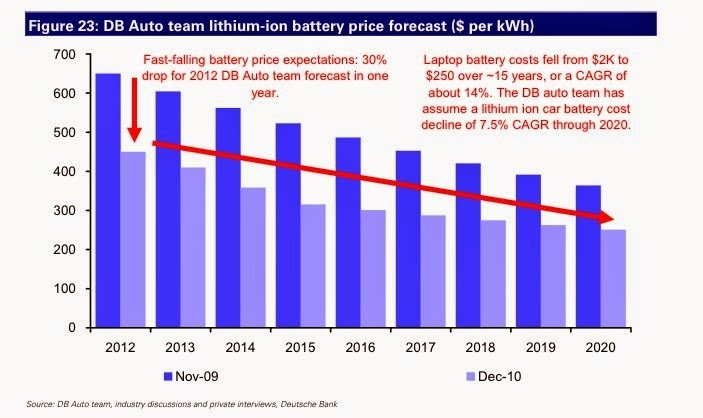 Below are two graphs that show historic battery prices, as well as future predictions. If these predictions are accurate, by 2025 plug-in cars become a no-brainer. They will be affordable, cheaper to fuel, lower emissions, and have better performance. The bulk of new car sales will be cars with cords. Plug In America said that they would run an Action Alert campaign to their members for the Oregon EV Rebate initiative. This would be similar to the one they recently did for Georgia. They asked me to write the first draft for the campaign. It is below. It is a little too long for their format, but this way that can pick out the points they want to stress and cut the rest. In truth, I must admit that I cobbled this together from the Union of Concerned Scientists and Drive Oregon's efforts to support the same initiative as well as some of my previous writings about the benefits of EV in Oregon. Electric vehicles (EVs) benefit people, the economy, and our air. Electric vehicles are good for our state and can save drivers money, but upfront costs are a barrier for many. Oregon has the opportunity to expand the number of EVs statewide with a consumer rebate. This program will make EVs more affordable and cut the state's oil use, while providing substantial cost savings for drivers. The benefits of EVs for Oregon are vast. They reduce oil use, have no tailpipe emissions, and save consumers money at the pump. But without a policy to reduce upfront costs, the EV market isn't growing quickly enough. The Oregon Clean Car Rebate would cut the sticker price of EVs, putting them within reach of more Oregonians. As more people buy or lease EVs, the price will come down and the market will grow even faster. That will help consumers as well as our state’s economy and climate. A February 2015 study found that the approximately 5,000 electric vehicles already on Oregon’s roads today contribute up to $10.15 million annually to the Oregon economy, and up to $676,700 in state and local tax revenue. EVs boost the state’s local economy in several ways. Oregonians spend more than $6 billion each year on gasoline and diesel. Oregon has zero oil wells and zero oil refineries. This means that the bulk of every dollar spent here on gasoline leaves the state. Electricity, on the other hand, is generated locally, so the “fueling money” spent for EVs stays local. One study found that every dollar shifted out of gasoline spending produces 16 times more economic activity in its local region. How would you like to pay just $1 per gallon? That’s not a fantasy: that’s the equivalent cost of driving an electric car in Oregon today. This means more money is left in your household budget for all the other demands and a little more fun. Because EVs have not been on the market very long, there is not a significant pool of used cars available yet. Additionally, because of the new technology, EVs still have a slightly higher sticker price. 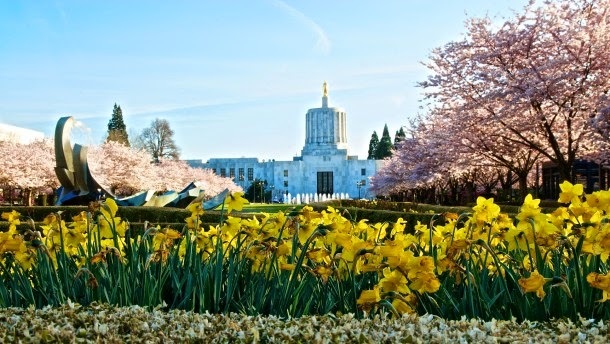 While there is a $7,500 federal tax credit available, some 80 percent of Oregon taxpayers don’t make enough money or have enough tax liability to take full advantage of that credit. That’s why the Energize Oregon Coalition, which includes more than 100 businesses, conservation and public health groups, and other stakeholders are supporting legislation to create a $3,000 Oregon rebate for electric cars. Studies suggest that even this modest rebate — about 10 percent of the purchase price of the most popular electric cars — can increase their market share by 50 percent to 80 percent, with twice the impact of an equivalent tax credit. In fact, Atlanta has become a leading EV market in large part due to Georgia’s state incentive. Thanks the efforts of the Oregon Department of Transportation, Travel Oregon, and others, Oregon currently has one of the best EV charging infrastructure networks in the nation. This brings Mt Hood, the Pacific coast, the Columbia River Gorge, Forest Park, covered bridge tours in Cottage Grove, cherry blossom tours, scenic river byways, the Oregon Dunes, beer and wine tours, and much more are all within the range of an EV in NW Oregon. Thanks to the abundant hydro and wind power in Oregon, most of the electricity these car use will be renewably generated. The electric utilities here are happy to see EVs on the road. EVs generally charge up overnight. This helps increased demand at off-peak times and helps stabilize the grid. The rebate is projected to cost less than $4 million a year — the equivalent of less than a penny a gallon on the price of gas. Getting more Oregonians behind the wheel of an electric car will produce dividends for Oregon families, for our economy, and for the environment for years to come. It’s an investment with great returns. Re: Your video "Plug in Folly - An In Depth History of the Electric Car"
Why do you ignore renewable energy? Wind and solar are being installed at record rates. Plug-in cars continue to improve every year as the grid greens. Gas, on the other hand, gets worse each year as light sweet crude is depleted and shale and other heavy sources are used that need more energy to refine. Even you admit that plug-in cars are already marginally better. How much bigger will that margin be in 2025? Why do you ignore national security? Electricity (even coal) is locally sourced in our own country. We don't have to guard the Strait of Hormuz or send troop into harms way to power cars with electricity. 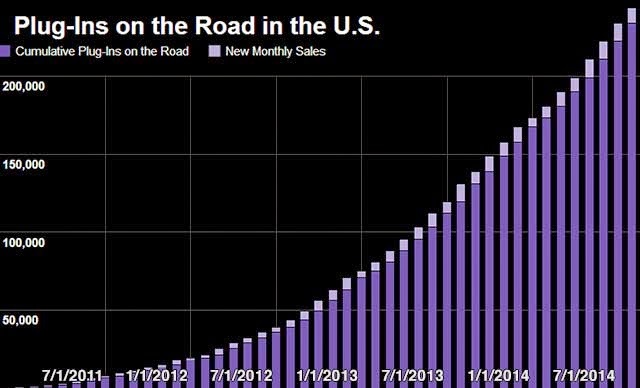 Plug-in vehicle (PEV) sales have just passed the 300,000 mark in the U.S., according to Plug In America’s sales counter. The rollover to 300,000 happened March 11th, just before noon Pacific time. This counter is not the official sales count, rather it is an estimate based on the recent rate of sales reported by the auto industry. Even though it is an estimate, there is a possibility, if you bought a PEV this month, that you could be driving the 300,000th plug-in car on U.S. roads. Way back in 2011, the Obama administration had set a goal for 2015 to be the year that there would be 1 million PEVs on US roadways. In January 2015, the US Energy Secretary conceded that the goal would not be met. There are many reasons that the growth rate has been modest compared to many of the grandiose predictions from 2011. As you can see in the graph below, 300,000 cars, albeit slower than some would like, is still a nice steady growth ramp. Unlike consumer electronics, production constraints are not easily resolved for electric cars. This will mean that plug-in vehicle growth will remain modest (linear), rather than spectacular (exponential) until Tesla's Gigafactory and its emulators are online. This is in-line with previous predictions we've made here that says PEV sales will remain relatively small but growing until 2020. 2014 saw new plug-in vehicles introduced by BMW, Mercedes, Volkswagen, and others. 2015 will continue this trend and could be the first year that PHEV SUVs come to the U.S. market; thereby opening PEV sales to a new market segment and continuing to convert more people to become plug-in devotees. Even the recent reduction in the price of a barrel of oil and the talk of 200-mile EVs "coming soon" will likely not reverse the growth trend in PEV sales. If this is the case, then we can expect to see about 140,000 more PEVs on the road for 2015. This would mean that near the end of 2015 we could see the PIA roll past 400,000 too. What is your perspective on IoT as it relates to the Connected Car? What do you think is next for the industry? Where do you see Cargo, if at all, in that industry? A connected car has a lot of potential. It could play my personalized internet radio station such Pandora or Slacker. It could run my favorite navigation app such as Waze, which lets you know about accidents and police along my route. However, at this point, I'd be happy with a clock in my car that I didn't have to set twice a year. I have been thinking about connected cars a lot since I took delivery of my Leaf in 2011. It has a 2G mobile plan that came with the car. It's used for CarWings and to update the charging station map. Although these features are nice, I think Nissan has greatly underutilized the potential. More recently we have seen Tesla pushing updates to their cars to increase horsepower and add features such as the creep option when stopped. 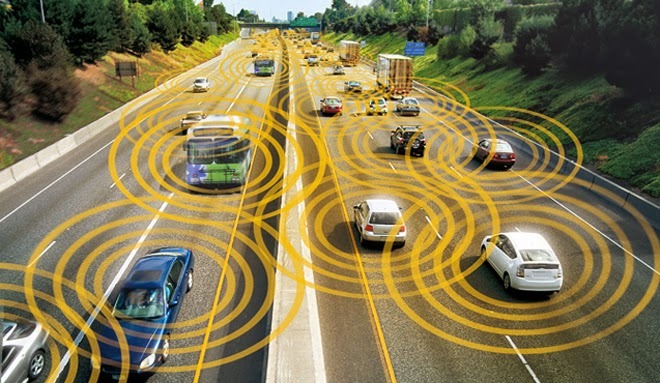 These things are just the beginning for the connected car. Tesla also has a feature that allows the car to see your calendar. This means, if you allow it, the car will know where you need to be and when you need to be there. It also has access to the car's charge level, maps, and traffic information. Put all of these together and now we are getting into something interesting. Here is a feature that would be handy. If the car needs service, it would just look my calendar and the available appointment slots and then find a time that works best and then just ask me to confirm the appointment. As more places start to support online booking, more appointments could be auto-scheduled. I'd like to be able to hop in the car and say, "Car, I need a haircut," then the car would scan for the nearest locations of my prefered stylist chain, make an appointment and plot a route. Similarly, I'd like to be able to say "Order my usual from Mod," or Chipotle or any of the places that I often get take-out and have the car place the order at the nearest location or at one that is along my planned route. I have been using Google Now for several months. There was one day that it popped up a notice and said that I had to leave in 5 minutes to make it to an appointment on time. I had not planned on leaving for another 20 minutes. My planned departure time would have normally gotten me there on time. G-Now, however, was aware that today there was a traffic jam on my route that it would add 15 minutes to my drive time. This is helpful, real-time, personalized information. Finally, compute devices are getting smart enough to do more than just throw information at us for us to filter and decipher. If a connected electric car had all the same information, plus knew charging stops, (if needed) recharge times, and could even reserve charging access, this would be a helpful feature. One of the features that is often touted with connected cars is the realtime car-to-car communication that allows vehicles to travel in tight packs and share their intentions with the cars around them before they maneuver. To me, this seems like a feature of autonomous cars more than just connected cars. This has been covered in detail in many other places, so I'll leave this idea alone for now. 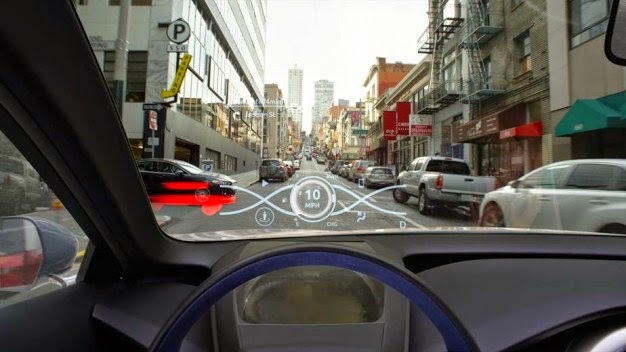 Assuming people are still behind the wheel in the near future, I'd like to see an augmented reality heads up display (HUD) on the windshield. The projection would need to be done in such as way that it appeared at the proper focal distance out on the road ahead rather than directly on the windshield. There are a lot of aftermarket HUD devices out there today, but I have not seen one that I like. Many of them spew social media feeds in front of the driver. This is a distraction and barely better than someone looking at their phone while driving. Other HUDs are like a fighter jet cockpit and have a deluge of dials and meters for so many things that I generally don't care about while driving. Just because you can display something does not mean that you should. What I'd like to see is a HUD that highlights potential dangers, enhances lanes indications, warns for lane departure, indicates the current speed limit and my speed, gives navigation hints, and not much more. And for the times I drive to a city that I am not familiar with, an audio tour guide would be a nice feature. The last thing they asked was "Where do you see Cargo, if at all, in that industry?" I have to admit that I don't know much about Cargo. I have no idea if any of my above ramblings would work with their product lines or future plans. When the Nissan Leaf came out, I was happy to see that they implemented several of the features that I recommended. However, the things that I recommended to Nissan were simpler UI settings and information displays. 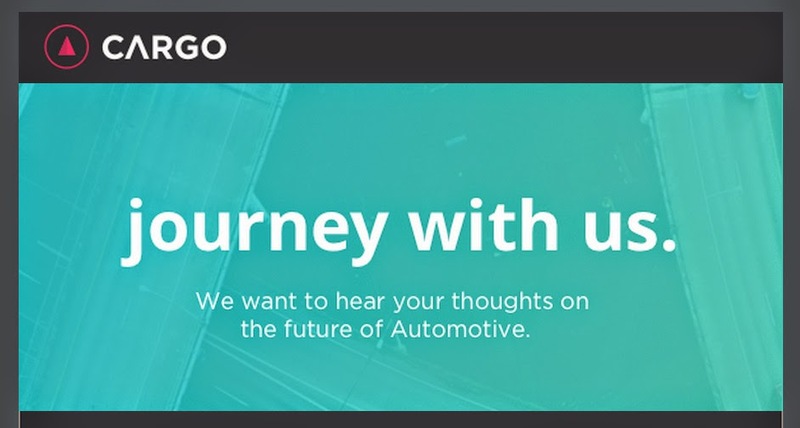 To fully realize the connected car will require infrastructure development, co-travelers, enablement efforts, and much more.